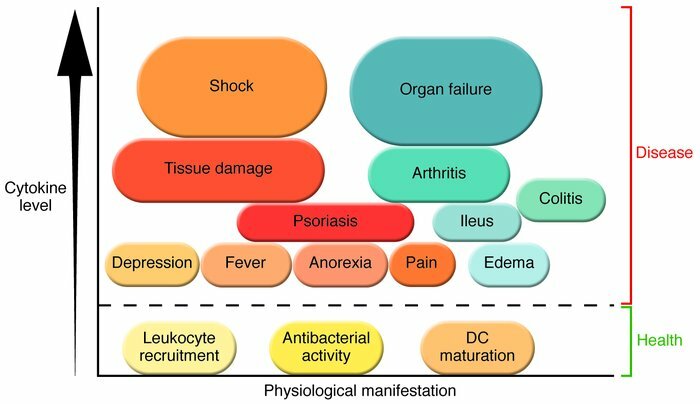 The cytokine theory of disease. Health requires that cytokine production is balanced: low levels are required to maintain homeostasis. Overproduction of some cytokines causes diseases that span the range of severity from mild to lethal. Some diseases can develop as a result of several different cytokines, as occurs, for example, in arthritis, which can be mediated by TNF, IL-1, or HMGB1. Other diseases may be specifically caused by individual cytokines, as occurs, for instance, in acute septic shock, with lethal hemorrhagic tissue injury mediated by an overproduction of TNF.